Organic production attempts to work more closely with nature than does conventional agriculture. However, without the option of chemical control, weeds and diseases can become obstacles to successful crop production. Diversity provides for resilience in nature, and the same principle can be applied within an agricultural system. Intercropping ideally allows for improved resource use and beneficial biological interactions between the crops. In other words, light, water and nutrients are used by the crops instead of the weeds, and some plants may enhance the growing environment for their companion crop plant. Cultivar mixtures work to minimize the spread of plant diseases by reducing the quantity of susceptible host plants. This study evaluated wheat cultivar mixtures and intercrops with wheat to determine whether these added elements of diversity would provide benefits to organic wheat production and reduce levels of weeds and diseases. Both the cultivar mixture experiment and intercrop experiment took place at Carman MB in 2004 and 2005 and at Clearwater MB in 2004. At both sites, experiments were managed organically. The Clearwater site had a history of organic production, while the Carman site had been managed conventionally prior to these experiments. Measurements in both trials included crop and weed biomass, disease levels, and grain yield. AC Barrie on the left and a mix of Red Fife, Marquis, and 5602HR on the right. The cultivar mixture trial implemented 4 varieties of wheat in various mixtures: AC Barrie and 5602HR are modern cultivars of Canada Western Red spring wheat; Red Fife and Marquis are heritage varieties that are no longer registered with the Canadian Grain Commission. Treatments in this experiment included each variety grown alone, all possible combinations of two and three varieties together as well as all four varieties together. Varieties were mixed together to obtain equal proportions of each variety in the mix, with a total seed population of 300 viable seeds per square metre. Wheat and cover crops - wheat and red clover, wheat and hairy vetch, and wheat and annual ryegrass. In all these systems, wheat was seeded at half the normal seeding rate (150 seeds/m2). The intercrops were also seeded at half the normal seeding rates, except for flax which was seeded at the full rate. Intercrops were compared to monoculture wheat planted at a full seeding rate (300 seeds/m2) and at a half seeding rate (150 seeds/m2). 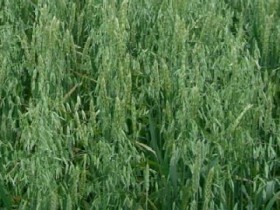 Economic analyses were carried out on the intercrop trial to see which mixtures would be most profitable for producers. Net returns for each system were calculated using the Guidelines for Estimating 2005 Crop Production Costs set out by Manitoba Agriculture, Food and Rural Initiatives, excluding herbicide and fertilizer costs, but including a seed cleaning cost for separation of intercrops and using organic market prices for grains. Wheat cultivar mixtures provided yield stability and resulted in lower disease levels than some varieties of monocropped wheat in this experiment. Of the four varieties tested, AC Barrie and Marquis were found to be most susceptible to disease (rusts, tan spot), while Red Fife had the lowest disease incidence. Red Fife's resistance to disease was attributed to its slower development (later heading). It was interesting to observe that the mixtures including Red Fife also had low disease levels, even when other varieties in the mix were highly susceptible to disease. The modern cultivar 5602HR had good resistance to rust but was susceptible to tan spot. In general, wheat grain yield did not vary greatly between treatments. Heritage varieties had comparable grain yields to the modern varieties, suggesting that under organic management, heritage varieties (specifically Red Fife) are competitive enough to produce yields similar to modern varieties that are bred for a high harvest index. The modern variety 5602HR also performed well in general in this experiment, and out-performed other varieties and mixtures at Carman in 2005 where plots were flooded due to excess rainfall. Variety mixtures generally outyielded AC Barrie and Marquis grown as monocrops and were comparable to Red Fife and 5602HR. As AC Barrie and Marquis suffered high disease incidence, it is not surprising that their yield was reduced. Even though cultivar mixtures including heritage wheat varieties may offer agronomic advantages, there are other considerations that affect the feasibility of implementing such mixtures on organic farms. Since Red Fife and Marquis are not registered with the Canadian Grain Commission, the marketability of these varieties is limited. However, Red Fife is gaining recognition through the Slow Food Movement and is in high demand from artisan bakers; therefore direct marketing of Red Fife may prove to be worthwhile. Marketing cultivar mixtures of registered varieties would not be problematic, but mixtures containing non-registered varieties would need to be marketed directly to buyers. A cultivar mixture would not have the same niche market appeal as pure Red Fife, and thus the marketability of these mixtures may be severely limited. Intercropping wheat with other cereals, other grain crops, and cover crops resulted in varying effects on weed suppression, disease levels, grain yield and the economics of the systems. In general, intercrops that developed a full canopy and/or competed with a major weed for resources caused a certain amount of weed suppression. In this experiment, oat, barley and flax intercrops and the annual rye cover crop resulted in lower weed biomass in some site-years. However, these intercrops also suppressed wheat growth by competing for resources with the wheat crop. This was especially true of the flax crop, which was seeded at the full recommended seeding rate. Wheat intercropped with field pea. The levels of foliar wheat disease were often reduced when wheat was grown with intercrops. Wheat grown with field pea had consistently lower disease levels, probably due to the physical barrier created by the pea vines. Flax also reduced disease levels in wheat (only measured at Carman in 2005). Although the intercrops tested in this experiment offered some weed and disease suppression in certain cases, it seemed to be difficult to suppress both weeds and diseases with the same intercropping system. Those intercrops that tended to have less weed growth had higher incidence of disease, and those that had lower disease levels did not suppress weeds. Grain yield was measured both in terms of wheat yield and total grain yield including the intercrop (not the cover crop yield, however). As expected, the full-rate wheat consistently had the highest wheat yield of all the treatments. Wheat with hairy vetch cover crop. Flax, oats, barley and spring rye competed aggressively with wheat, and tended to reduce wheat yield to less than the yield of half-rate wheat. However, when the grain yield of the intercrop was taken into account, the cereal intercrop systems (oats, barley, spring rye) performed quite well, with total yields often similar to or greater than the yield of full-rate wheat. Wheat intercropped with field pea, oriental mustard, and the cover crops had variable results. For example, hairy vetch totally overwhelmed the wheat crop in 2005, but resulted in yields similar to half-rate wheat at both sites in 2004. This demonstrates the importance of environmental conditions in determining the "success" of any particular intercropping system. Although grain yield data is important, the feasability of implementing intercropping systems depends heavily on the profitability of the system. Table 1 below demonstrates the variability in net returns for the intercropping systems tested in this experiment, ranging from $655/acre to a loss of $82/acre. Full-rate wheat was among the most consistently profitable treatments, and even half-rate wheat was more profitable than many of the intercrop combinations. Wheat-barley and wheat-spring rye were the more profitable cereal intercrops. The wheat-mustard intercrop proved to be among the most profitable combinations, while wheat-flax and wheat-field pea gave inconsistent but potentially promising results. The cover crop treatments tended to have lower returns because the cover crops did not provide a saleable product, nor did they generally have significant positive effects on wheat yield. In fact, the cover crops resulted in negative returns in two cases (see Table 1). However, not included in this analysis are the benefits that cover crops can provide to the following crop. Legume cover crops in particular can provide signficant nitrogen contributions to the soil, which are especially important in organic cropping systems. Cereal intercropping systems were the highest yielding among those tested in this experiment, but they also present the greatest difficulties in separating the wheat from the other crop. This may limit the practicality of these systems on organic farms. Flax is an important crop in organic systems because of its role in crop rotations as well as the price premiums available. The wheat-flax intercrop was not particularly successful in this experiment because of the high flax seeding rate; however, at a reduced seeding rate, a wheat-flax intercrop could prove to be both practical and profitable. Wheat with annual ryegrass cover crop. Field pea also showed some potential as an intercrop with wheat, offering some disease suppression and fairly good grain yields, as well as contributing nitrogen to the system (although this was not measured in this experiment). Some shattering was observed during field pea harvest, suggesting that harvest should occur promptly to avoid harvest losses. The wheat-mustard intercrop was very profitable in one case, but was also subject to flea beetle infestations, making this a more risky option for organic farms. However, if producers wish to grow oriental mustard, intercropping the mustard with wheat reduces the risk involved, since the wheat can compensate for a mustard crop failure. Wheat grown with a red clover cover crop was moderately successful; however, hairy vetch and annual ryegrass competed too aggressively with the wheat crop in wet growing conditions. 5602HR is a modern high-yielding wheat variety suited to organic production. Red Fife is a heritage wheat variety suited to organic production. Red Fife had low disease incidence and is in demand from artisan bakers. Cultivar mixtures can reduce disease incidence but may present marketing challenges. For a wheat-flax intercrop, reduced seeding rates should be used for both wheat and flax crops. Flax can outcompete wheat if seeded at the full rate. A wheat-field pea intercrop can reduce disease and contribute nitrogen to the system. Wheat-field pea should be harvested promptly to avoid shattering. Wheat-oriental mustard can be profitable but is also highly susceptible to flea beetle attack. Do not include mustard in rotation too frequently to avoid flea beetle infestations. Red clover appears to be a better cover crop choice than hairy vetch or annual ryegrass. Hairy vetch and annual ryegrass can outcompete the wheat crop, especially in wet conditions. See also Agronomic Benefits of Intercropping Annual Crops in Manitoba for more information on intercropping research at the University of Manitoba.